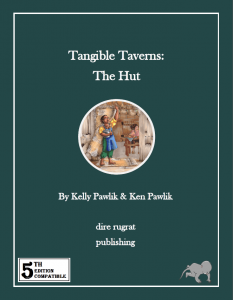 This week Dire Rugrat Publishing released Tangible Taverns: The Hut (5e). This marks the first tavern released since October 2016 when The Hidden Oak came out, and we are pretty excited about it. The Hut was initially created back in late 2015 for Wayfinder issue #15, which released in May 2016. Here it appeared set in the world of Golarion, with ties to Paizo’s Golarion canon. It was fun and flavourful, and only 1,500 words. The Hut: A Tavern on the Sellarn River was like a taste tester. One of my favourite things about being included in the Wayfinder magazine was the art that accompanied my piece of writing. In honesty, I think it was partly this piece of art that stopped me from expanding the tavern sooner. 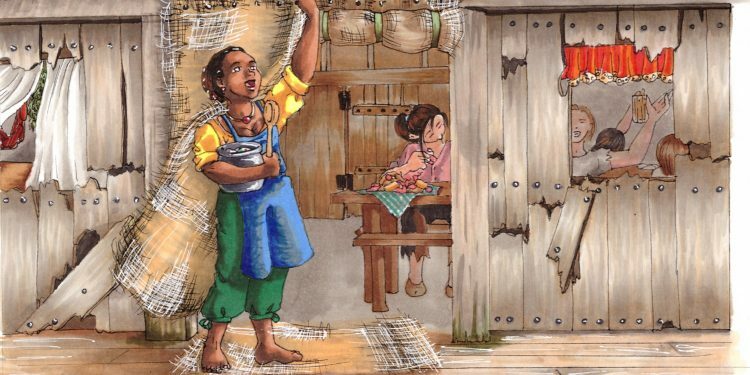 It was a Tangible Tavern in the making. At the time The Hut was started, all of our taverns were created with black and white images. Being so small and new, we had no budget for art. The piece Jess Door created was inspired. I didn’t see it until the magazine was published, and as I paged through the fan publication I held my breath. 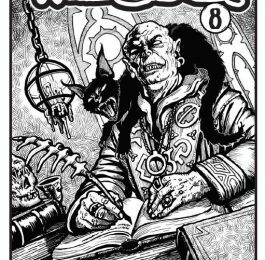 It was the first time my RPG work had been published by anyone else, had been laid out by anyone else, and had been presented to a larger audience. It suddenly felt very real. I grinned at Jess’ accompanying picture. A few weeks later, when I held a printed copy of the magazine in my hand, I grinned again. The Hut felt alive, out there in the world. 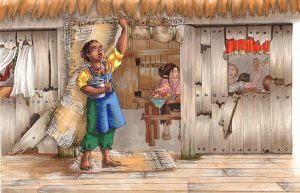 Jess’ image of Mama welcoming new comers to the ramshackle refuge still makes me smile every time I see it, and I didn’t want to disappoint this cheerful proprietress by providing NPC patrons that weren’t as colourful as her. For two years The Hut sat on the back burner, simmering like a pot of stew before the dinner hour approaches. 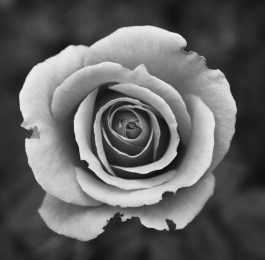 We thought of it on occasion, wondering what Mama might be up to, what troubles may have come her way, and who may have rested their weary head inside the walls of her dilapidated home. We were busy with life, rugrats, gaming, and creating a products for some of our other lines. And so Mama and her tavern waited. Yesterday the answers were revealed. Mama had companions join her. The world around her began to form. Sure, the tavern remains tucked away, but it finally came to life. Giant-slaying Tryx and her beloved animal companion stumbled on Mama and began to develop an attachment to the kind woman. Rolph, the luckiest dwarf one may ever met, awaits a new band of adventurers looking for assistance. And there’s Dexter… the capable ranger who has fallen for the oblivious caretaker. 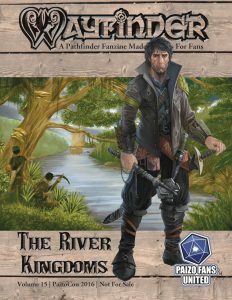 Now available in full Tangible Tavern length, The Hut has been updated, NPCs have been added, 5e stat blocks created, and the world it is is set in has been modified, allowing it to easily be dropped into just about any campaign (including Wizards of the Coast’s Tomb of Annihilation!). It also features a full page colour map, colour art for each NPC, and all the other Tangible Tavern features you have come to love. If The Hut sounds great, but 5e isn’t your thing, let us know! The smaller version of The Hut is available in Wayfinder, but if you’d like to see it in all its glory as a Tangible Tavern, let us know! 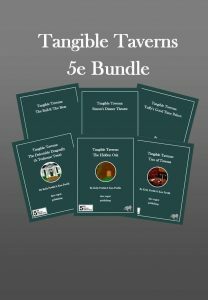 Did you try out Tangible Taverns: The Hut (5e)? Let us know your thoughts! Write a review, sound off below, or drop us a line. And if you haven’t picked up our other taverns yet, you can find them in this discounted bundle pack, available for PFRPG and 5e!